Thanks for visiting our small home office photo gallery where you can search lots of home office design ideas. I love home office design. I have a sizeable home office in the basement at our home. However, you don’t need a lot of space to create a great working space. Check out the examples below. Below is our collection of examples and ideas. How’s this for an efficient home office? It’s a closet built under a staircase. While not ideal for working at home, for a place to work on a computer, it’s ideal. The designer put in a lot of care here with the built-in floating desk, floating shelves and colors. Even the stools fit under the desk so the closet doors can be closed. Here’s a tiny room with a full-width desk, large arched window with original brick walls painted white. While small, this is a comfortable and attractive place to work. This is a fabulous example of a small home office. This is a beautiful design that anyone could incorporate into a small spare bedroom or any extra room. The built-in shelving, contemporary desk, guest chair and wood flooring with area rug make this a cozy and comfortable small home office space that anyone would be happy to have. Seriously, look closely at this and you’ll see it’s not expensive and not difficult to execute this look. Here’s a bonus room space that’s converted into a small home office. It’s pretty minimalist, but does the job. If you have no dedicated room available, look for an unused corner where you can put a small desk (we have this IKEA desk as well). You really don’t need much space and as you can see this work area looks good, is very inexpensive and serves perfectly well for a home office. Here’s a great design in between bedrooms. This is a jack and jill home office which is cool by fitting it in a small thoroughfare space between two bedrooms. Classic craftsman style home office with light wood desk, hardwood flooring and matching floating shelves. I love this modern attic home office with two skylights and small glass-topped modern desk. It’s a beautiful space where it’s removed from the rest of the home for privacy and quiet. This is about as small as it gets with this tiny home office placed under a staircase. The desk is just big enough to accommodate a laptop and mouse pad. It works though. It may be a small room, but this office is definitely the executive style with built-in white shelves, gorgeous dark wood desk with guest chair. The room has new hardwood floors with a well-selected area rug that ties the room together. Home office with grayish blue walls, a window with floor-to-ceiling curtains, floor lamps, low yellow walls, and a matching yellow armchair facing the wooden office table. Simple home office with built-in open shelving for plenty of storage and an attached space-saving built-in desk paired with a wicker armchair and wastebasket. Attic home office with freestanding open shelving, a long rectangular office table, and a stylish lamp. Small home office with a small corner window, an office table with drawers, and a couple of chairs. Tropical style home office with an indoor plant, green plush chair, wicker furniture, glass table, and a beige ottoman. Small home office with large windows, floating shelves, and wood flooring. Tropical style home office with shutter windows, woven furniture and accessories such as the wall stars and hanging fishes, an indoor plant, rustic table, and wood flooring. Small home office with recessed lighting, built-in shelving, built-in desk with drawers and paired with an accent velvet chair, a wall mirror, and carpet flooring. Spacious urban chic home office with white walls decorated featuring a decorative industrial copper lighting, a floating shelf with pipes, woven blinds, crates that make up a stylish desk with storage and paired with a cushioned crate ottoman, and a colorful rug on the wooden flooring. See all our home office designs here. If you lack square footage in your home, you can still create an ideal home office by taking advantage of every inch of space that you’ve got. Don’t let a small home office room cramp your decorating style. This gallery will show you several clever ways to work with the space you have and still create a stylish small office. It doesn’t matter if you don’t have the room, storage or square feet, you don’t need to give up on the idea of having a useful and stylish home office. There are tricks and tips you can to utilize storage and create the feeling of a more open and airy office. You can decorate your office in just about any style you want and still use these ideas to utilize better the space you have. You don’t need a large, extravagant desk in your home office. In fact, out of 40,090 home offices, about 34.96% of designers preferred built-in desks. 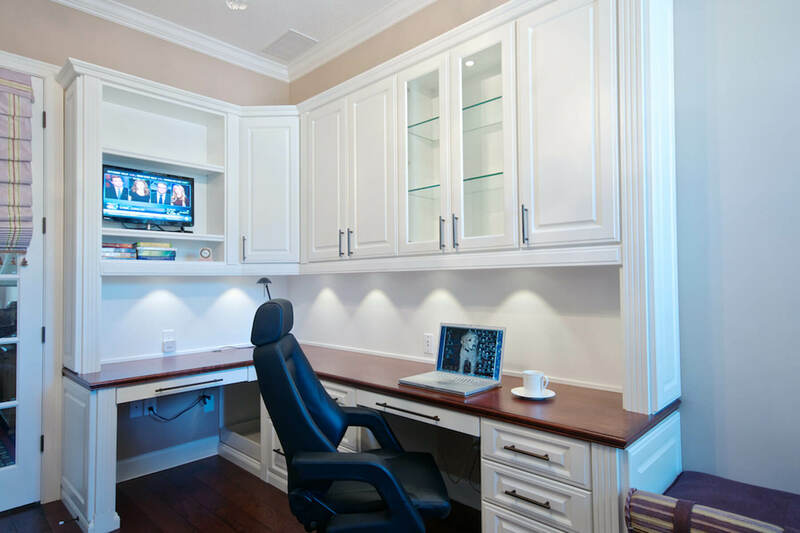 Built-in furniture is advantageous because it blends in well and looks like a part of the house.This is a great option for small home offices because it can be tucked away and doesn’t make the room feel smaller. In small space, everything counts, including the colors. To make your small home office feel a bit bigger combine light and reflective colors such as whites, soft blues, and greens. Try painting any trim or moldings lighter than the walls to make them appear to be further back. Avoid dark, bold colors because they tend to make a room look smaller than it actually is. Floating shelves are the perfect way to add some storage or decorative elements into a room without taking up any floor space. Depending on how tall your walls are, you can stack several shelves above each other. You can use these to showcase a beautiful collection of your favorite books, artwork, or any other accessories to go along with your style. Clutter looks unattractive in any type of room but it downright just doesn’t belong in a small space. When there’s too much stuff in random places, it makes the small space feel very cramped and unproductive. Keep everything tidy and organized and put things in their place.